There is something so special about pistachios. Growing up, I always felt like they were the “fancy nut.” Maybe it’s their distinctive green color or their utterly unique flavor that made me covet pistachios. With their royal history and their hefty price tag, it’s no wonder I sensed that pistachios were special. 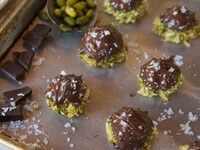 Little did I know just how many delectable treats can be made with these sweet green nuts. 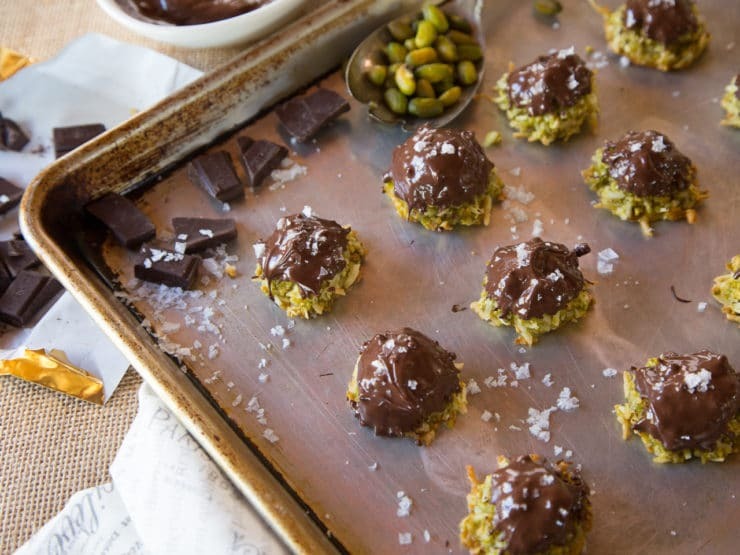 Macaroons, those ubiquitous haystacks of Passover sweetness, seem like a perfect vehicle to showcase the pistachio in all of its glory. Macaroons originated in Italy in the 1700s, where they were first made with almond paste. Italian Jews began making their own versions of the recipe during that same century. Jews appreciated that the chewy cookies contained no grains or leavening, and thus could be enjoyed during Passover. In Mediterranean Sephardic Jewish communities, macaroons are usually made with almonds, like they originally were in Italy. But there is no law that says we can’t use pistachios! American macaroons are more often made with coconut, which provides a nice, chewy base. After experimenting a bit, I found the rich combination of pistachio and coconut to be utterly irresistible. I added rosewater to the mix, inspired by the classic Persian pistachio/rosewater flavor combination. Then (because why stop now?) I dipped them in dark chocolate and sprinkled them with sea salt flakes. Whoa. Be still my heart! Skinning the pistachios takes some time, but for a special occasion like Passover these are well worth the effort. Technically you don’t have to skin them, but your macaroons will be a bit less light/fluffy and the color won’t be as bright a green. If you plan a bit in advance, you can skin the nuts a day prior while binging Netflix. A little extra effort goes a long way here. These macaroons are worth the time, they are truly special. Enjoy! 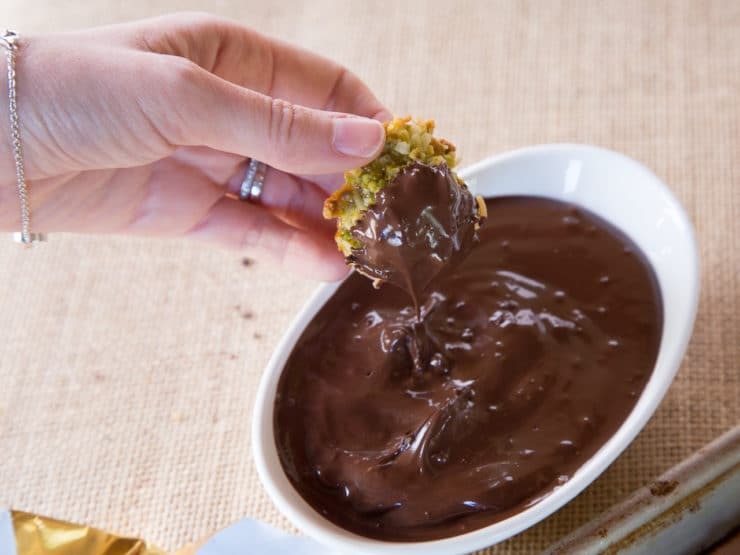 Delicious chocolate-dipped coconut treats for Passover or any time of year. Gluten free, easy and tasty. Preheat your oven to 325 degrees F. In this recipe, you can use either grated fresh coconut or dried coconut flakes. If using dried coconut, rehydrate it by pouring it into a bowl and covering it with warm water. Let the coconut soak for 5 minutes, then drain. Squeeze all the excess liquid out firmly with your fingers. Proceed with recipe. 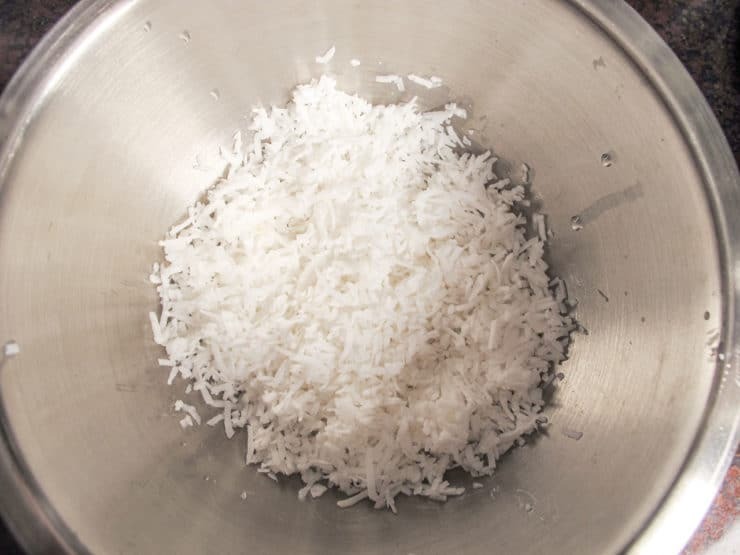 If using fresh coconut, no need to prep it-- simply proceed with recipe. Skinning the pistachio nuts will result in a brighter green color and a prettier end result, but if you are short on time it is not required. You can learn how to skin them by searching my blog for "how to skin pistachios." 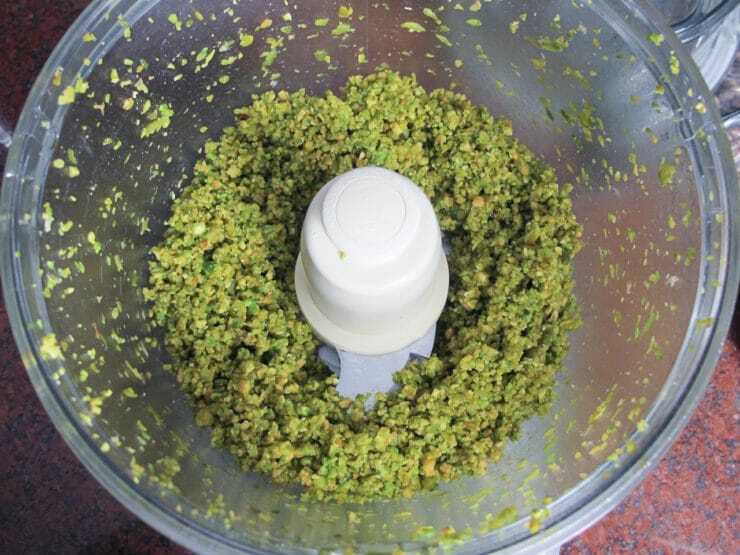 Place skinned pistachios into a food processor. Process for a few seconds until the mixture becomes a mixture of fine crumbles. Don’t over-process and let it turn into a paste… it should resemble crumbs. Beat the egg and egg white together in a small bowl. Stir the processed pistachio crumb mixture into the rehydrated coconut along with the sugar, potato starch, rosewater or vanilla, beaten egg and egg white, and salt. Stir with a fork well to combine, making sure all ingredients are evenly dispersed. Line a baking sheet with parchment paper or a silpat. Place rounded tablespoonfuls of the coconut mixture onto the baking sheet, evenly spaced, forming the mounds into rounded haystack-like shapes. They will feel very loose and delicate at first, but will firm up as they bake. Place the macaroons in the oven and let them bake for 30 minutes, until the bases of the haystacks turn light golden brown. Don’t overbake or the macaroons will become dry. Remove the macaroons from the oven. 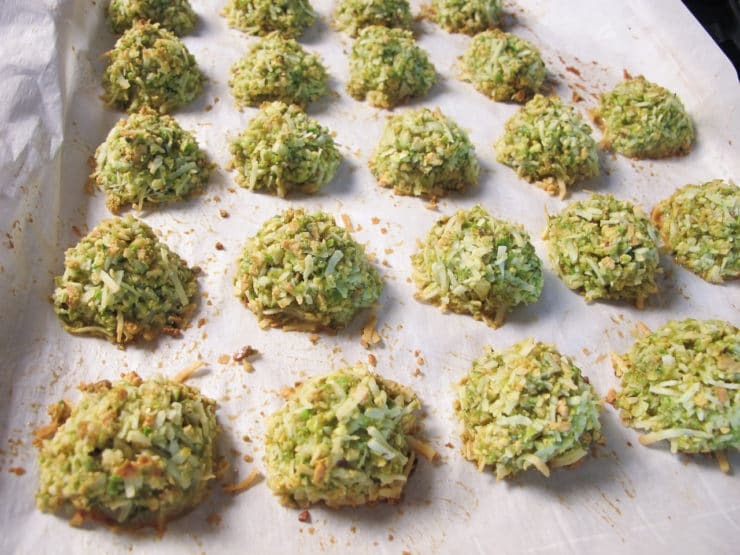 Allow the macaroons to cool directly on the baking sheet. Do not try to remove them before they'll cool; when hot, they are delicate, but they become firmer as they cool. Melt 9 oz dark chocolate, either in the microwave or in a double boiler. If using the microwave, heat at 50% power for 1 minute, stir, then continue to melt in 15 second bursts at 50% power until the chocolate becomes smooth. Grasp each macaroon at the top and dip the top into the melted chocolate, twisting it into the chocolate and coating it about 1/4 inch up the sides. Place back on the baking sheet. 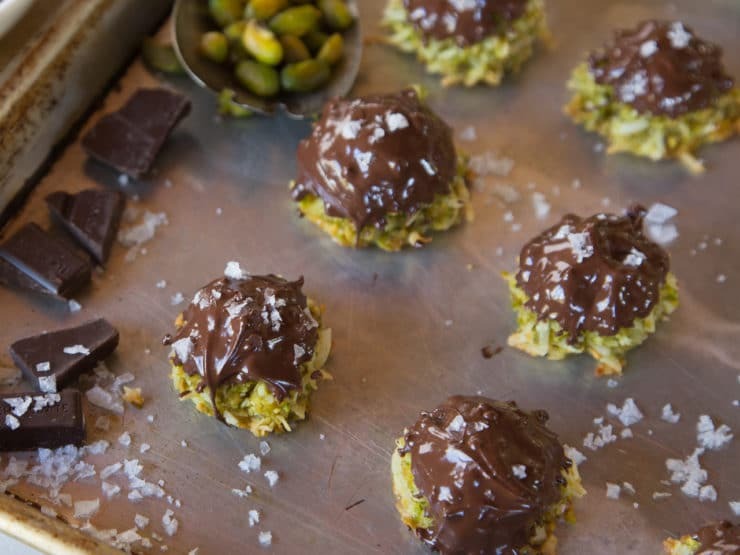 While the chocolate is still wet, sprinkle a few sea salt flakes on top of each macaroon. Allow chocolate to dry completely. I like to store these macaroons in the refrigerator for best shelf life. If kept in a sealed container too long the internal moisture from the macaroons will “melt” the sea salt, so if you’re planning on keeping them sealed for a longer period of time, you may wish to skip the sea salt entirely. Your recipes are wonderful. Thank you! Many dietary needs in my family which seem to delete my love for trying new recipes but you make it easy to fulfill both their needs and mine as a passionate cook and baker. You did it again! What a delish treat! I added orange zest to chocolate. MMMM! Also, I think this would be a great pie crust! You are my Holiday Heroine! OMG! I just made these. I split one with my husband and he said these are the best macaroons he’s ever tasted! I also just made the Sephardic Charoset Truffles, which I have made many times. Every recipe is a major hit! Happy Passover to you! Hi .. these look yummy.. but can you please suggest an alternative to potato starch? You can substitute corn starch or flour, if you’re not worried about keeping them kosher for Passover. As a baker and chocolatier (small home business), I love working with your recipes. And as a history buff, I love what I learn from you. I wanted to pass on something I just learned about. 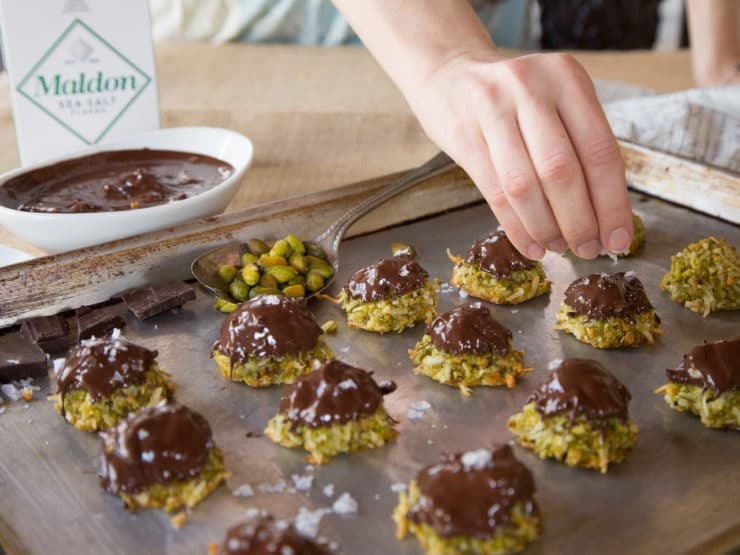 In New Orleans, there is a company called “Blue Frog Chocolates” that makes beautiful chocolate Seder dinner plates, Matzo Crunch, and “Frogs” and “Locusts” truffles that are Kosher. Thought immediately of you when I saw them. I LOVE the Seder plate. So just an FYI, cause I think you’ll love them! They are online. And can’t wait to make these macaroons!! Thanks for being there, and sharing your love with us!! With regard to rehydrating the coconut — is this the coconut sold in bags in the baking section of the store? Hi Jessica, there is an important distinction here – unsweetened coconut vs. sweetened coconut. Baking sections will usually carry both. This recipe recommends unsweetened coconut, which will need to be rehydrated before use. However, baking sections often carry sweetened coconut. If using this type, it won’t need to be rehydrated (it’s already moist) and it’s already sweetened, so you can cut the sugar in the recipe down (by how much I’m not sure– I haven’t tested it, but if I were to guess I’d probably cut it to 1/4 cup). Hope that makes sense! Happy Passover to you and your family. 2. Does it matter if shelled pistachios are roasted or raw? Trader Joe’s are roasted but I have access to raw ones as well. You’re right Faith! Sorry about that, I corrected it. You should use raw for this recipe, they will hold together better because they have more moisture. Hi Shiri, they last 4-5 days outside the fridge. If using salt you’ll have to store them uncovered, but they may dry out a bit. If not using salt you should keep them in a covered sealed container. I’d like to make these macaroons a day or two before the holiday. How long can I store them in the refrigerator before the internal moisture from the macaroons will “melt” the sea salt? can you make them with almonds? I would love to make these but I have an excess of sweetened coconut…can I use it? Ilene– yes, however you will need to cut the sugar or they will turn out far too sweet. I’m not exactly sure how much you’ll need, but if I were testing it I would try cutting the sugar to 1/4 cup and see how that goes. Did you use salted or unsalted Pistachios? the pistachios and chocolate sound great, but we don’t care for coconut. Any substitution for the coconut? I’m sorry Ed I don’t have a substitution I can recommend here, the coconut is vital to the overall flavor and texture here. Wish I could help! You Aced it again Tory!!!!! my first “test drive” disappeared in no time. These are definitely be on my Pesach table in Melbourne Australia. 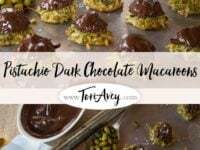 Tori – I also meant to ask if you had ever made the recipe with pistachios with the skins – or has anyone else who is reading the site.? Hi Louise- yes I have, and they will still be good. The texture is just slightly different and they won’t look as green/pretty. Otherwise not such a big difference. 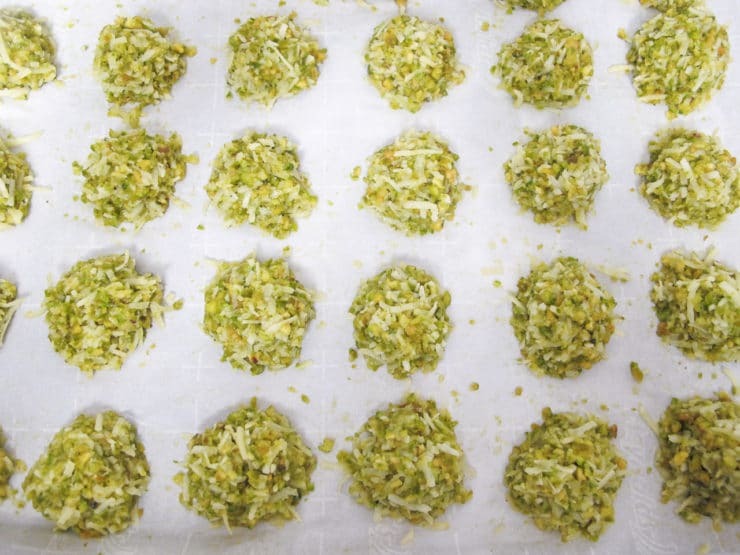 FYI, you don’t need to fully dry out the pistachios after skinning them for this recipe, they will be fine if you proceed straight from skinning to processing (the macaroons can take a bit of extra moisture). Very glad you enjoyed them! 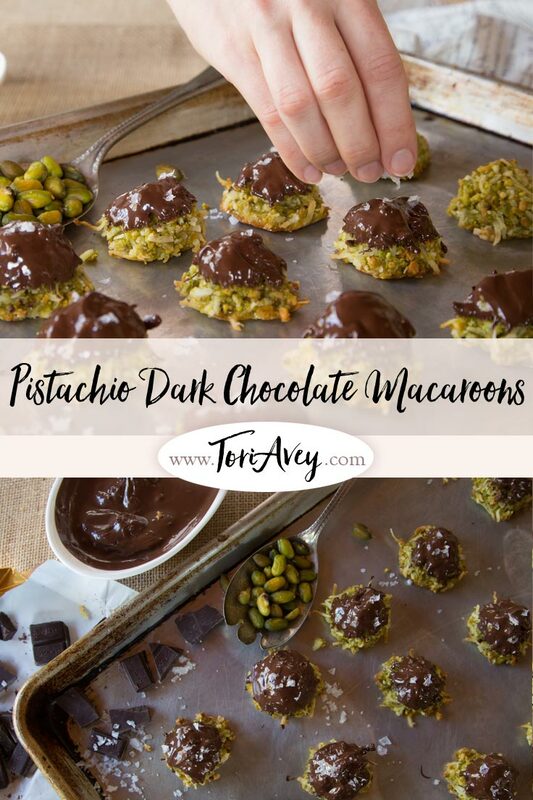 These were delicious and I would definitely make them again if I could find shelled pistachios without the skin. I found the process of taking off the skin and then drying them tedious and not worth the effort since I also love regular macaroons. 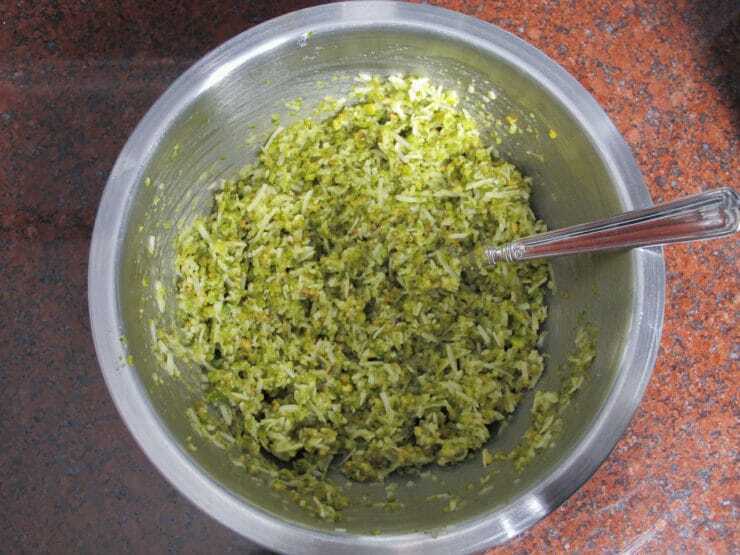 If can find shelled pistachios – then they are very easy to make and very delicious. Thanks for the recipe. What a great combo! Mouth watering! Trader Joe’s sells shelled pistachios, which I always keep on hand. Can’t wait to make these for Passover! Do you think they would freeze, Tori? Hi Marlene– yes they should freeze nicely. Wrap them in plastic wrap (in groups of 5 or 6) and place in an airtight container to avoid freezer burn. These look amazing & will definitely make for Passover. Could you tell me the Ingredients in oz instead of cups as I’m not sure on the conversions. Hi Jacquie, I’m so sorry but I don’t have time to convert all of my recipes at this point (I wish I did!). Hopefully soon I’ll be able to provide that information. Meanwhile, if you do an online search for recipe conversion calculator you should get several results that will allow you to easily convert. Wow! Thank you Tori! Heavenly! Looks great, definitely on for my gluten-free needs come Yom Tov. A perfect marriage of tastes and textures! I just saw bags of shelled pistachios on sale at Target and was trying to think of something special to do with them. Perfect. Thanks, Tori! Grab them Sheila! They can be pricey, a sale is a good thing! Tori is that sweetened coconut??? Can the pistachios be substituted to make it nut free? Perfect! Thank you Tori! ? You out did yourself this time! Thanks Pam! I’ve been wanting to post this recipe for a couple of years now. Finally got around to it. They are special little treats! 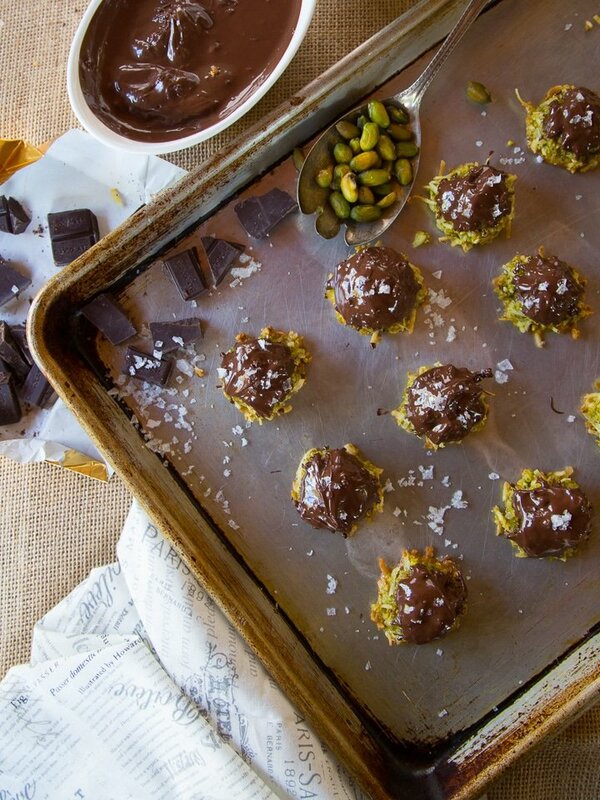 You can’t go wrong with ingredients such as chocolate pistachio and sea salt. YUM. how to make these without the egg?